‣ In the panel view area, click the Add View button and select Panel. This section of the Panel view is where information, such as the duration of the current panel, name of the current panel and name of the scene in which it is part of is displayed. It is possible to edit some of the fields—see About the Storyboard Structure. This collapsible section of the Panel view is where the information, such as the number of selected panels, the in and out of the current selection, as well as the duration of the selected panels. These fields are for reference only; they cannot be edited. Click the Collapse button to hide the section and leave more room for the Script caption field. Once it is collapsed, you can click the Expand button to display the entire section again. 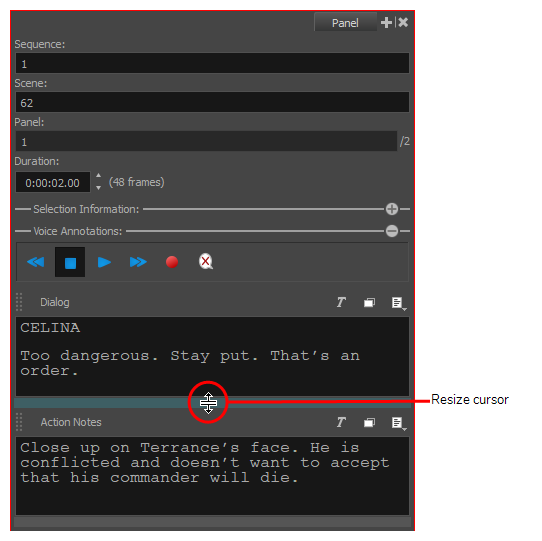 It is possible to add voice annotations to a panel. 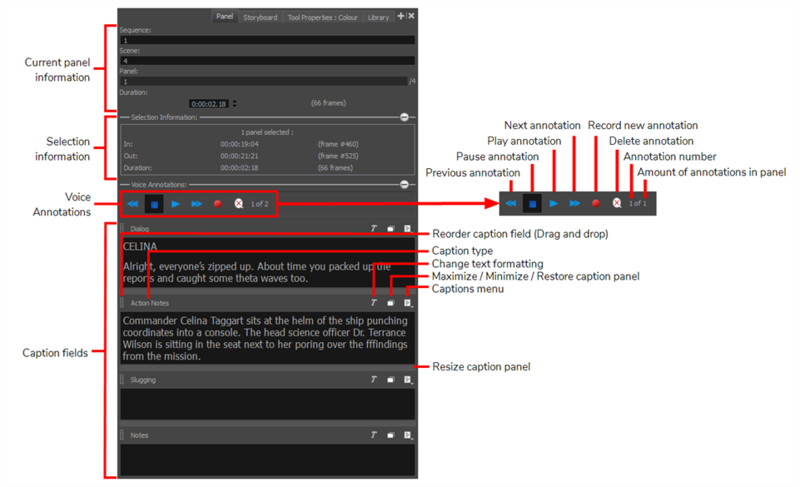 This collapsible section is used to control and edit these annotations—see About Voice Annotations. Displays the Text Formatting toolbar for formatting the text in the Script caption area. When there are two or more panels present, resizes the panel in three different sizes: opens panel fully, opens mid-sized panel or collapses the panel. Lets you access commands for adding, importing, deleting and renaming captions. You can also import scripts created in Final Draft—see Creating Projects from Final Draft. Dialogue: The lines of dialogue spoken by the characters in the current panel. Action Notes: The actions performed by the characters in the current panel. Slugging: Notes regarding the timing of dialogues and actions in the current panel. These can be added while creating the storyboard to give instructions on how to create the animatic. Notes: Any relevent information about the current panel or the current scene, such as the scene heading, the characters and props, ambient sounds, background and foreground actions, continuity notes or, if working on a live action project, the cast, crew, props or material required to complete the shot. The caption fields are named by default, you can easily change the name of these fields by clicking the Caption Menu button and selecting the Rename Caption option. Once you have changed the names of the captions and you are certain that you want to keep these names throughout the project, you can set the new names as default by selecting Caption > Save Captions Layout as Default from the top menu. Click the Text Formatting button. The Text Formatting toolbar displays. Format the text in the panel—see About the Text Tool. Click on the Collapse / Expand button. The panel toggles between fully expanded, expanded and collapsed. Hover over a bar between two panels. When the bar turns cyan and the resize cursor appears, click and drag to resize the panel.